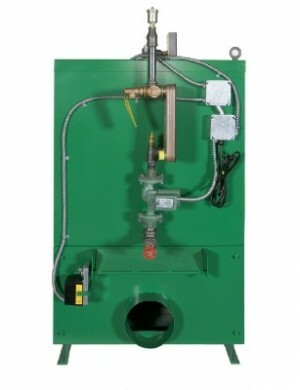 The Greenwood Hydronic Wood Furnace Series is a new design in wood burning boilers. The very first concept of the Hydronic Wood Furnace was thought of about 20 years ago. Greenwood offers a safe and clean alternative to the gas and oil burners of the world. Greenwood Hydronic Wood Furnace Series offers a safe and clean way to heat your home. In addition to being one of the cleanest forms of heating, it is also environmentally friendly in terms of emissions and it is a renewable energy source. Unlike the other furnaces that do not have the capacity to keep a heat at 1100 degrees Fahrenheit, but with the Greenwood Hydronic Wood Furnace it is capable to heat about 1800 to 2000 degrees Fahrenheit. This is accomplished by when the heat from the fire is caught by a water heat exchanger that is located above the firebox that is placed in the path of the escaping gases. 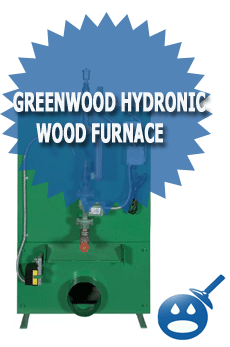 The Greenwood Hydronic Wood Furnace offers a combustion efficiency of about 100%. The combustion efficiency is determined by how much of the wood mass is transformed to energy. Some of the features that are installed in the Greenwood Hydronic Wood Furnace are the Aquastats; these are used to control the operation of the furnace. The aquastat is an attached to the interface of the furnace. The heat exchanger, which is an option to the furnace, is used to transfer the heat from the furnace to the heating system that you have in your home. It works well with baseboard and forced air heating systems. The system will work great with an opened or closed system. The thermal efficiency of the Greenwood Hydronic Wood Furnace is 85%. Located inside the fire chamber is a ceramic refractory and it casts about 6″ thick and capable of working with temperatures in the range of 2500 Degrees Fahrenheit. The Greenwood Hydronic Wood Furnace includes an updraft flame path and a downdraft design for thermal transfer. There are three different models in the Greenwood Hydronic Wood Burning Furnace. The Series includes Models 100, 200 and 300. The Rated Output of Btu’s per hour are 100,000 Btu’s, 200,000 Btu’s and 300,000 Btu’s per hour. The heating capacity for the Model 100 is up to 4,000 Square Feet, Model 200 has a heating capacity of 8,000 Square Feet and Model 300 has a heating capacity of up to 12,000 Square Feet. Due to the size of the furnaces, the Model 100 has a maximum log length of 18″, Model 200 has a maximum log length of 28″ and Model 300 uses a maximum log length of 38″. Each wood furnace can easily burn un-split logs and either dry or unseasoned logs. These types of logs burn cleanly and evenly. By using this wood-burning furnace to heat your home it can save you a lot of money on your heating bills and your energy costs. These systems are easy to install and will work great with many home heating systems and heating applications. Q: Can these furnaces be installed indoors and outdoors? A: Yes, the Greenwood Hydronic Wood Furnace has models that are designed for indoor and outdoor use. 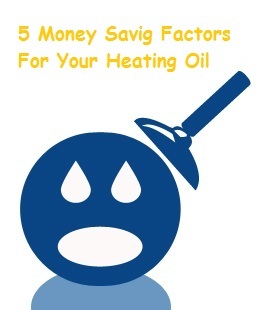 Q: How much money can I save on my heating bills, if I switch over to a wood burning system? Q: Won’t my Greenwood Hydronic Wood Furnace get corroded and rusted being an outdoor unit? A: No, the Greenwood Hydronic Wood Furnace are coated on the outside and the heat exchanger inside the furnace is protected with a propylene glycol solution that will prevent and protect the unit not only from corrosion but from freezing as well. If you are thinking of switching, then the Greenwood Hydronic Wood Burning is just what you need, it is efficient with both thermal and combustion efficiency. 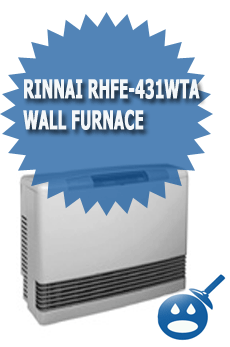 These furnaces are easy to install and will save you a lot of money in the long run. I recently installed model 300 and heat 7-unit apartment building and my 3500 sq ft residence. Thus far at 5 to 10 below 0 I am getting from 6 1/2 to 8 hr burn time. My wood is rock maple but is wet as it has been uder snow all winter. I have no problem getting the unti up to temp 165 degrees and damper will shut. I have noted that one must burn wood to get the heat. If wood is almost gone temp starts to come down and after 8 hours I have seen it as low as 130 degrees. I expect next season when I have my wood inside and seasoned better I will have a bit longer burn time. I will also have larger wood – alot of my wood is 3 to 6 inches. I have hot water radiation in the apt building and in-floor in my home. furnace does all my domestic as well. Have had no complaints as far as low heat but have only been running for two weeks. Unit is 150 ft from apt building and 250 from my home. I believe they have stopped producing units and are not responding to warranty requests? I have my greenwood 100 for 2 1/2 years. It has been nothing but problems. 1 1/2 years in the heat exchanger sprung a leak and had to be replaced. Which I had to do myself, talk about a nightmare, heavy and dirty.This thing builds creosote like you wouldn’t believe. Cleaning the exchanger is also a near impossible chore. I have tried every recimmendation from green wood and it still disappoints me. It leaks smoke from every seam when it is idle. I am ready to remove it, but I have 7 cords of wood ready to go. Wish I went with a Tarm would have cost me the same and had a better product. Great goods from you, man. I have understand your stuff prveious to and you are simply extremely great. I really like what you have got here, really like what you are stating and the way through which you say it. You’re making it entertaining and you continue to take care of to stay it smart. I can’t wait to read far more from you. This is actually a terrific web site. I had a model 100 installed last fall. The installation wasn’t the best. I added a draft inducer to the flue that really helped with a bad creosote problem. I saw on their website last year that they have a cleanout kit where you can remove a side panel to gain access to the manifold and air tubes. Part of the kit is extra insulation to enable future cleaning ease, and a special scraper to clean the tubes. There is also a drill mounted cleaning attachment to help. Just tried to call Greenwood Recovery LLC (425)424-4700 and only got the machine. Their 800 number is disconnected. The maniforld is warranted for ten years, but won’t make a difference if they are out of business. Unlucky owner of a Greenwood 100. I have tried to email, but recieved no response from them. Filed a complaint with the Better Business Bureau. So far the BBB has recieved no response from Greenwood after two attempts to contact them. I called a local wood boiler dealer who I bought it from, but no longer carries greenwood and was told they are out of business. This really stinks as this cost me a good chunk of money to purchase and install. I am still recieving emails to buy a Greenwood furnace though, I have recieved two in the past 2 weeks, so I don’t really understand how if they are out of business I am still recieving emails. I have model 300 now just over a year and noticed the outer skin is rusting badly. I can put my finger through holes on the top panel. Obviously will have to replace skin around the boiler this summer with galvanized or stainless and will leave hatches on top and side for cleanouts for the manifold going down the backside of the boiler – I note on other sites this is complaint with other boilers – apparently the steel came from China. What do you plan on doing about the insulation. I too will be replacing some panels, but don’t know what to do about the insulation. My insulation is falling apart and will not be able to be reused. I have a Greenfire wood boiler. Less then 2 years old and the outter skin is blistering and rusting out and needs to be replaced. Chinese steel. There was four of us that bought this boiler or next size up. I had very little water when it was first started up and it is a rust bucket. I have been using silicone from a auto parts store. I use the black high temp stuff and works pretty good. I’m still wondering if anybody has any idea for the insulation inside the unit. What can I use to replace it? Wonderful idea. Greenwood Hydronic Wood Furnace is made in a different way. It saves about 70% of your electric bill. It is a renewable home heating solution. Appreciate it for sharing How Often Should You Service Your Furnace? | Heating, Furnace, Air Conditioning , High Efficiency , Toronto Gas Company with us keep upadte bro love your article about How Often Should You Service Your Furnace? | Heating, Furnace, Air Conditioning , High Efficiency , Toronto Gas Company .